Grace and peace! The past month has been “hectic” as we say in Cape Town. But God is good, and we have much to be thankful for. As always, we would like to express our thanks for all of your prayers as well as the many generous gifts we have received for our ministry in South Africa. Your partnership with us is essential for our ministry to proceed, so we rejoice that God has given us such faithful friends and supporters. Last Tuesday afternoon, after much work and prayer, we received word that our application to accredit our Bachelor of Theology had been approved by the Council for Higher Education. The Principal, Dr. Daniel Simango, received an email notifying us of the result. He immediately forwarded it to me. The documents were long and beaurocratic, so after frantically searching the first paragraphs for some indication of the outcome I scrolled page after page to the bottom and finally found the word “Accredited” in bold. I raced up the stairs to Daniel’s office, where we finally realized what had happened and began celebrating! We are now one step closer to the end of the process. Since this was our first accredited programme, we still have a few more administrative steps to be registered as a degree-granting institute. We hope to submit more documents today in response to concerns raised in regard to our distance programme, and early next week we expect a visit from a registered auditor. Please continue to pray that we will be able to finish this process in time to register students for next year’s January intake. Last Thursday was our annual graduation ceremony. It was a wonderful time of celebration. Thirty students graduated from our three year Christian Leadership Programme (CLP) which provides vocational ministry training. 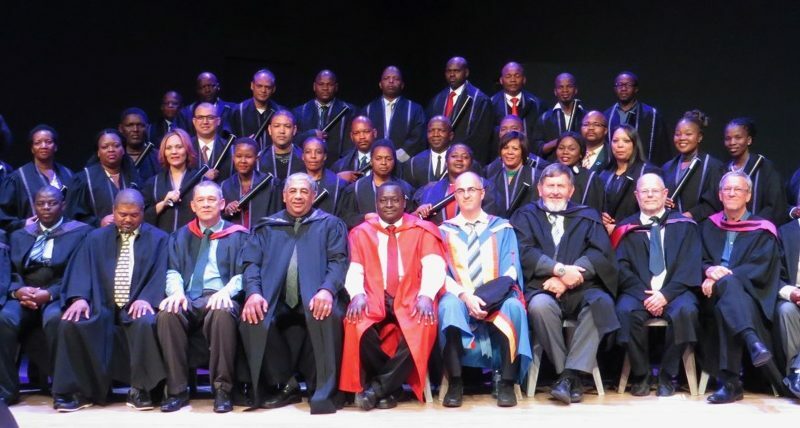 Another eight finished their studies at BI and graduated with Bachelor degrees from North West University, as well as one student who received an Honours degree for an additional year of studies after his Bachelor degree. I would love to share the stories of each of our graduates with you, but I can only highlight a few. The graduate that impressed me the most was Caiphas Ngarivhume, the director of SIM Zimbabwe. Caiphas completed the entire degree by distance from Zimbabwe. He and his wife traveled from Zimbabwe to Cape Town to celebrate his accomplishment. Another graduate who was special for me is Hannah Arendse. Hannah shared the award for the student who had demonstrated the most spiritual growth in their time at the Bible Institute. She was in my weekly Fellowship Group this past year, and was part of our team that traveled across South Africa to Kimberley in March for a week of ministry. Hannah will be marrying a former BI graduate in early December, and then moving to Pretoria with her new husband. She is hoping to continue training as a Christian counsellor, and I have met with her several times to advise and encourage her to pursue this calling. Many of our graduates are already involved in ministry, beginning new ministries, or are hoping to begin missions work. Please pray for them as the transition from studies to full-time ministry can be full of uncertainty. Our returning students are now on their summer break until classes resume in January. Please pray that this would be a productive time for them. Some are using this time to explore possibilities for long-term service in missions, including one student who is currently in Kenya for the next nine weeks, and another who is serving in Lesotho for month.